Original, authentic, unmatched--- the gold standard for building and testing grip strength. Designed to produce the quickest gains in grip strength and hand health. Premium materials, proprietary elements, precision manufacturing and unrivaled customer support---all from the USA. Available in 11 strengths for a perfect fit, whether you are just starting off, rehabilitating an injury, or can already crack coconuts with your bare hands. Captains of Crush Grippers blazed new trails in the gripper world, taking what had been largely a cheap, imported plaything and turning it into a beautifully designed and crafted tool for serious strength athletes. 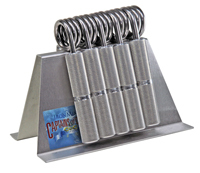 Made in the USA and known worldwide, nothing else puts power in the palm of your hand like a Captains of Crush Gripper. 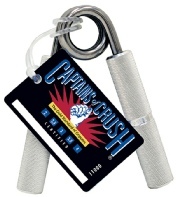 Captains of Crush Hand Grippers come in 11 strengths, so whether your grip strength sizes up as XS or 3XL, there is a Captains of Crush gripper perfectly suited to your requirements. For beginners, seniors, rehab, and easy warm-ups. For teenage athletes, weekend warriors, strong guys who like light warm-ups. For everyone who is ready for serious grip training: athletes, public safety & miilitary personnel. Point Five c. 120 lb. The newest gripper in the CoC family; bridge the gap between the Trainer and the No. 1. No. 1 c. 140 lb. No. 1.5 c. 167.5 lb. Ease into the No. 2. No. 2 c. 195 lb. Success here means you've got a grip to brag about. If someone's life or your sport depends on your grip strength, conquer this gripper. No. 2.5 c. 237.5 lb. A stepping stone to the No. 3. No. 3 c. 280 lb. Certifying on the Captains of Crush No. 3 Gripper is the most widely-known and highly-respected feat of grip strength in the world. No. 3.5 c. 322.5 lb. Warning: the No. 4 is in sight. No. 4 c. 365 lb. Certify the No. 4 and you have proven yourself on the final exam for crushing grip. Use your browser back button to revisit this page for each size you would like to order. The CoC Caddy is a valuable training tool--as well as a handy way to keep your grippers in place. it comes in two sizes, holding 5 or 10 grippers.